One of the biggest obstacles to the prevention of genocide and other large-scale human rights abuses is obtaining accurate information about lead-up events in time to do something about them. Placing human observers on the ground is a key means of gathering this information, but humans get hurt and killed, and being an observer in one of the world’s hotspots often exposes that person to grave risk. Last week, we encouraged readers to join the fund-raising drive in support of SHIM-1, which aims to make satellite imagery available to select humanitarian groups as part of this pilot program. Up-to-date satellite images could go a long way to help the Sentinel Project and other groups identify genocide lead-up activities as they are happening and on a scale that provides much broader coverage than is possible with human observers. Another surveillance tool is also being touted for use by human rights groups. 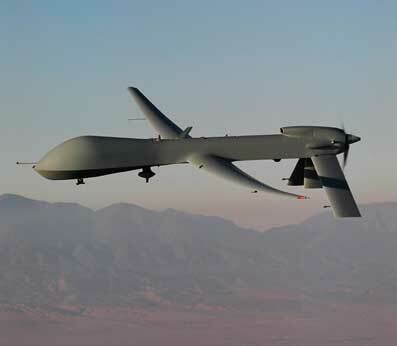 Last year Andrew Stobo Sniderman and Mark Hanis, co-founders of the US-based Genocide Intervention Network, wrote in the Opinion Pages of the New York Times that drones should be used as human rights surveillance tools in places like Syria, where the security of human observers is a serious issue. Drones can also go into hidden places, opening up surveillance opportunities that even satellite images can’t offer. In an upcoming blog series on the use of drones, we’re going to be looking at some of the issues surrounding their use, including illegal invasion of airspace, privacy issues, and transparency and accountability. We’re hoping that readers will give these issues some serious thought and join our online discussion of this important topic. Stay tuned!